Protected by DMCA and CopyScape. 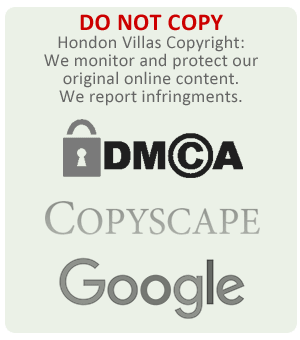 IMPORTANT WARNING: Unauthorised use of original and copyright material from any of our numerous Hondon Villas websites is prohibited and you could be breaking international copyright laws. Any infringement may result in severe penalties with the DMCA and Google (or other search engines) or even prosecution. We WILL REPORT websites that have no permission to use our copyright material. We take copyright theft very seriously. Over the last 5 to 6 years numerous people have stolen our original work or used it without our permission. Whilst we are flattered that our content, articles and branding is so good people wish to copy it we WILL NOT tolerate its use if used in a negative way, when permission was not gained from us and especially when other people use it further their own purposes such as to confuse, deceive, to be malicious or exaggerate their relationship with us. We use various online detection tools for possible breaches of our published material. We get weekly reports and time-stamped alerts of all possible copyright infringements which we then check and assess its impact. If we think there is a case of copyright theft we will act. It is ALWAYS better write or design your own web content. You'll be a better person, Google will love you again and you will not get a notice from the DMCA/us or a possible ranking penalty from Google. Simple, right? If you really want to use our content and intellectual property THEN SEEK PERMISSION from Hondon Villas. It's the law! *Digital Millennium Copyright Act. If we find that anyone has used our original or copyright material in their online publications, websites or other digital forms without our express permission we will ISSUE a DMCA TAKE DOWN NOTICE. A DMCA* Takedown Notice is an official request for an individual, a company or an Internet host asking them to takedown a certain piece of content that infringes someone else's copyright. Such as large blocks of text, slogans, logos, design, branding, images, graphics or other media. NOTE: Over the last three years Hondon Villas HAVE SUCCESSFULLY REPORTED and CLOSED DOWN 19 websites or pages via DMCA Takedown Notices of websites that had copied or used our material without permission. In most cases either the perpetrators website host closed the site down or Google de-ranked the site to make it almost invisible to search engine results (rendering it useless). In three cases, including a local estate agent, the penalty was to publically apologise for their breach of copyright in full on social media after we exposed their misdemeanour. Copyright of original and creative work is a form of protection provided by law in all civilised countries to authors of "original works of authorship." Copyright is granted automatically from the moment something original is created by an author / artist until such time that author legally passes copyright on to another person or company. Copyright material will includes literary, dramatic, musical, artistic and other creative works. Copyright material, in general, cannot be used unless permission is given by the original author, his/her agent or the registered publisher. Using copyright material without permission or a license is likely to be illegal and subject to possible prosecution or penalties. A copyright holder can prevent others from copying, performing or otherwise using the work without his or her consent.